That’s quite a claim, but folks, wait until you try this guacamole. It is hands-down the best guacamole in town. No joke. 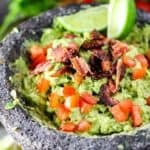 With just a handful of fresh ingredients, and the right technique, you can produce restaurant-style guacamole right at home. 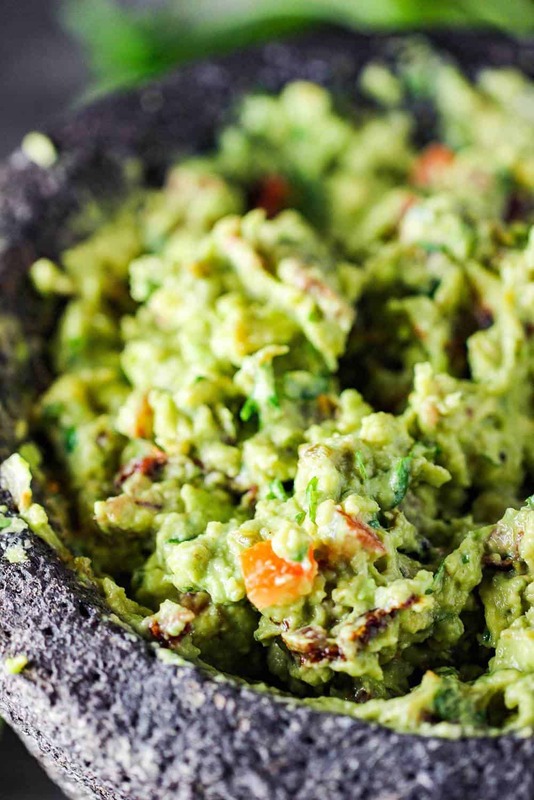 Watch us show you how to make the Best-Ever Guacamole! Make sure you pick up the freshest ingredients from the farm or the produce section from your favorite food market. Our favorite avocados to use are Haas Avocados from Mexico. If you don’t have a molcajete, (the lava vessel) then you can use a sturdy bowl and a wooden spoon. 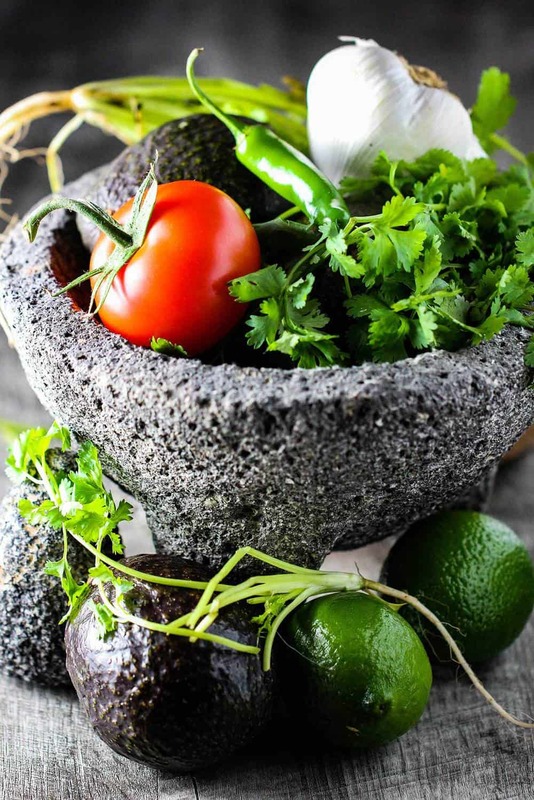 But we have to say, there truly is something magical about a molcajete that just make guac taste better! We think the best guacamole has a smokey taste to it. Not too much, but just enough to deepen the taste. This can easily be achieved with the use of roasted and slightly blackened peppers. Our favorite pepper to use is a seranno pepper. Spice level is easy: 1 pepper is Mild. 2 peppers are Medium and 3 peppers mean Spicy! (Hint: The seeds in the pepper add heat…keep the seeds for heat, remove for no heat). 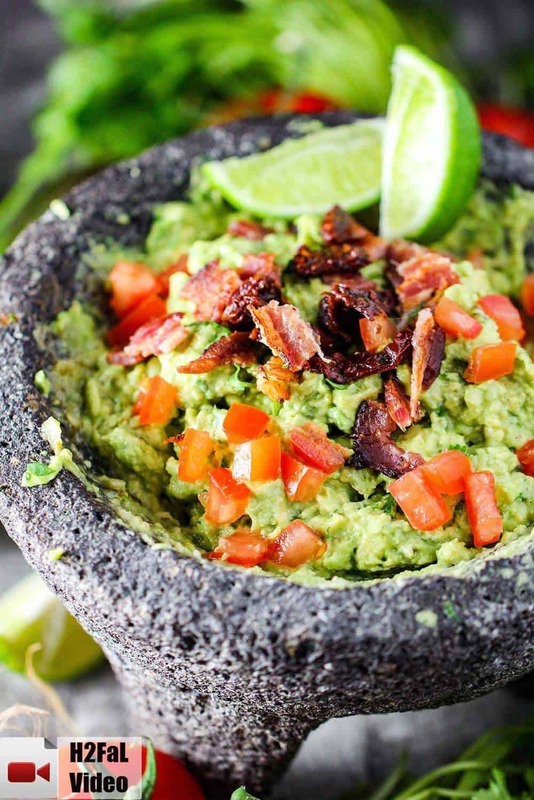 Let’s keep building the flavor profile for this best-ever guacamole with: BACON! Pick up some smoked Applewood bacon and then simply cook the bacon in the oven for about 15 to 20 minutes, until crisp. The bacon compliments the avocado and other ingredients perfectly. Use the pestle from your molcajete to muddle the blackened pepper(s), onion, garlic and salt with the fresh lime juice. Muddling is simply applying pressure to the ingredients until they become almost paste-like. You can certainly use a wooden spoon to do this as well. When choosing an avocado, you want to make sure it is soft to the touch, but not mushy feeling. 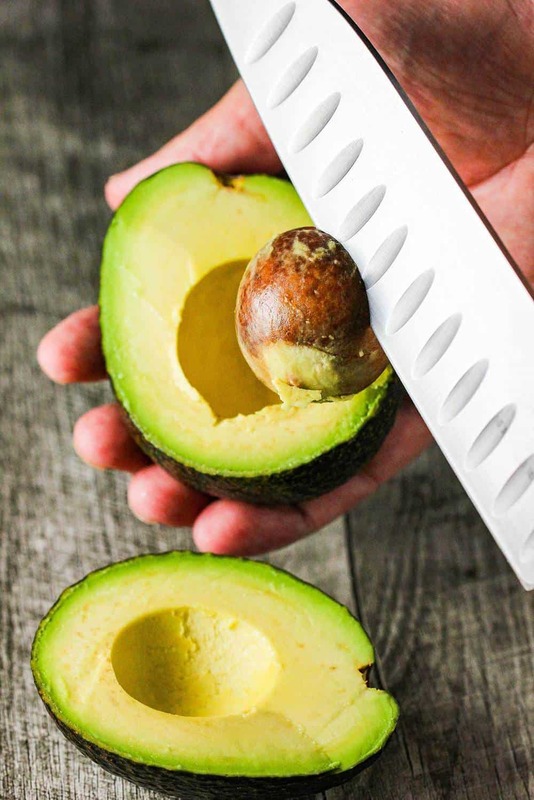 Carefully use a sharp knife to cut the avocado in half, starting at the top and working around length-wise. After pulling the two sides apart, carefully insert the edge of a large knife into the pit, and then twist. Remove the pit over the edge of your sink or a bowl…do NOT try and remove with your hands! Then, run a knife along the inside of the skin, and then use a fork, spoon, or your fingers to remove the flesh. For ultimate flavor, we use a combination of diced fresh tomatoes and sun-dried tomatoes (in oil is just fine). The bacon and tomatoes are beautiful when scattered on top of the guacamole. And then even better once mixed into the guacamole! None of the ingredients overpower any other, and the avocado remains the standout taste and texture. After mixing everything together, this guacamole shines. It’s perfect for a party, or pre-dinner appetizer, or a side dish for an amazing Tex-Mex dinner. And it is an essential component when preparing Steak Fajitas! We know it’s a bold statement, but we truly feel this is without-a-doubt the Best-Ever Guacamole! This is even great the following day. Just give the guac a good turn with a large spoon (it may be a little brown on the surface, which is normal and not unhealthy) and you’re good to go. 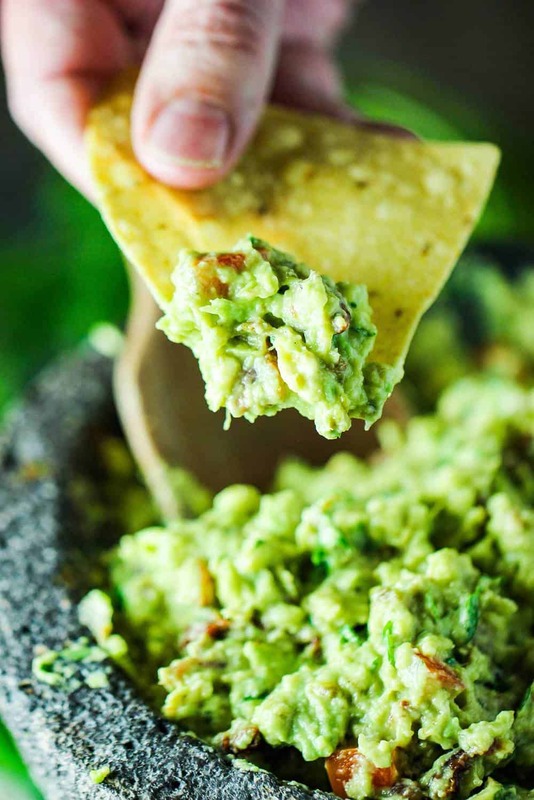 Now, open a cold Mexican beer, grab your favorite corn tortilla chips…and make this amazing homemade GUACAMOLE! Best-Ever Guacamole really is that: the best ever. Be sure to grab the freshest ingredients, with avocados that are soft to the touch, but not mushy. The roasted peppers add a depth of the taste that just can't be beat. All the other ingredients work perfectly together! Ole! 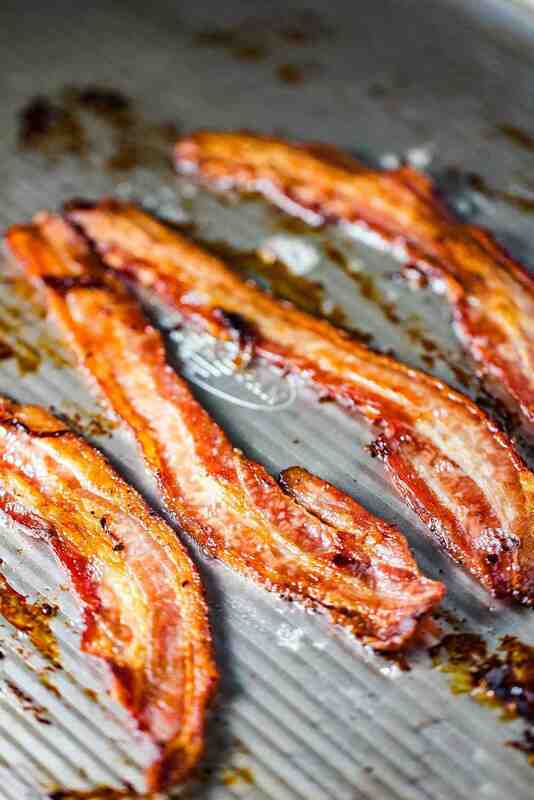 Lay the bacon on a baking sheet and cook for 15 to 17 minutes, flipping halfway through, until crispy. Let cool, then dice. Set aside. 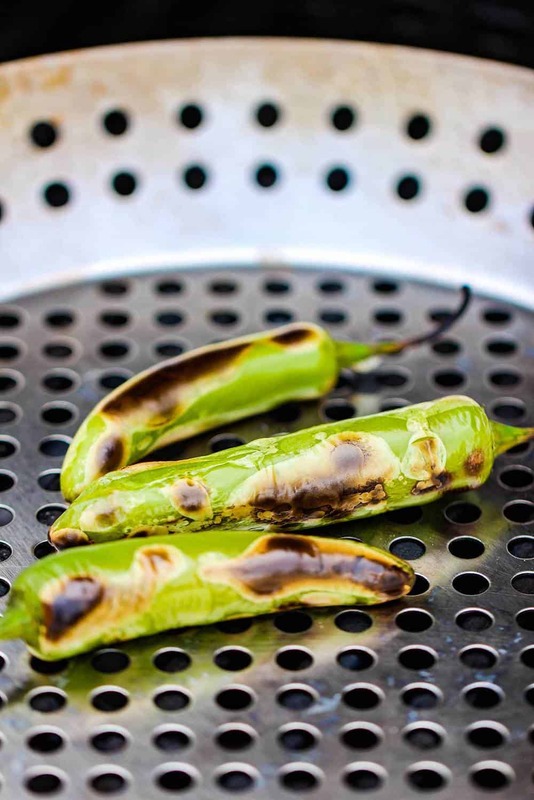 Heat your grill to medium heat, or heat a cast iron skillet to high heat. Add the peppers (using a grill pan, or aluminum foil on the grill), and roast until blackened and blistered. Remove, let cool, then dice. Set aside. 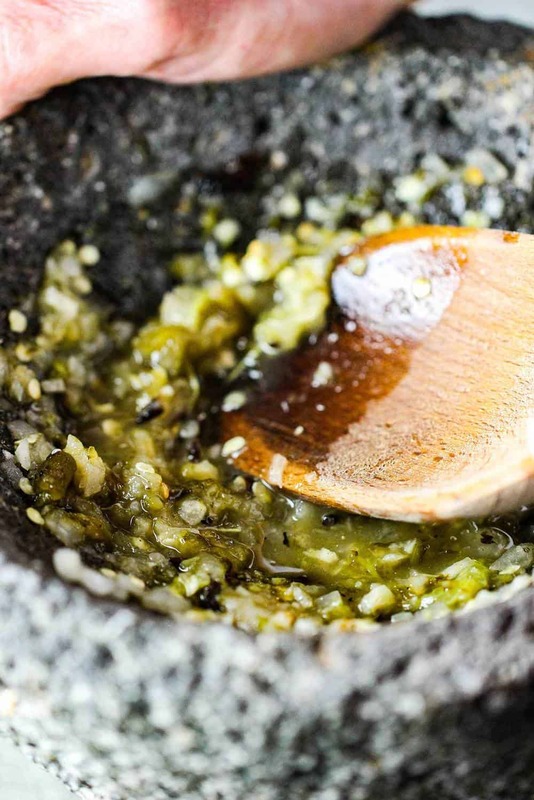 In a molcajete (or sturdy bowl), use a pestle or wooden spoon to muddle (grind) the roasted pepper(s), garlic, onion, salt with the lime juice, until almost like a paste. Cut the avocados in half, running a knife around the pit from top to bottom and back up again. Remove the pit and scoop out the flesh from each half. Add the avocados and cilantro to the muddled ingredients in the molcajete and mash with the back of 2 forks. Mash until you reach the desired texture. Top with bacon, fresh and sun-dried tomatoes. Serve with warm tortillas chips at once!